← Rage against free speech? Is there an expiration date on apologies? Recently I was faced with the reality that my actions in high school hurt someone. More accurately, that my inaction hurt. I was alerted to a blog post written by someone I attended school with who was bullied mercilessly. It was written with such honesty and pain that it brought me to my knees. While I don’t remember seeing any of the bullying happening to him personally, I saw and heard plenty in those days that I turned away from, pretending that nothing was happening. After reading his post, I expressed my apologies and regret at not being a better person so many years ago. Yesterday I read an article about a brave young women who posted a poem about her experience being bullied on a class reunion website. Her classmates were moved by her words and have since rallied with apologies and a fundraiser to get her back to the reunion. It makes me wonder, do apologies go stale after so much time has passed? I was not the victim of bullying in my youth. Cruelly teased at times, yes, but not bullied. If I had been, what would those apologies mean to me today? Would it give me any solace knowing that my tormentors had grown up to be decent people that regret the actions of their youth? Would it make my younger me feel any better about what happened? I know in 12-step programs one of the steps is to make amends with the people that we have hurt. Making amends is referred to as restoring justice and it does not always mean apologizing directly to the people we have hurt. Often it is making changes in our life and in our behaviors to make it better, safer, for the people around us. Amends seems a far greater gesture than an apology. Most of us will not have the opportunity to apologize to the people we hurt directly. 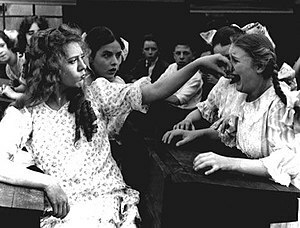 In the case of bullying, either by torment or apathy, we are called to recognize our part in the cruelty that some people dismiss as a “”rite of passage.” We have a chance and an opportunity to make amends to the children of our past by teaching OUR children that taunts, jeers, exclusion and violence are NEVER acceptable towards another human being. We can be an example of how to stand up for others that are being treated unjustly, and not walk away from another person in pain. While I was offered an opportunity to apologize to someone directly, and would do it again, I think it’s much more important that I make amends for my part in history. I am teaching my children that everyone has a purpose, a value, and a gift to share. I do not permit mean comments about other children, whether it is about their clothes, hair, or any other attribute that may seem different. I do not force friendships, but I expect tolerance. I work every day at modeling acceptance, and it’s not always easy, but I know that my little charges are watching, listening, and taking their cues from me. I would hope that my amends will make a difference, even if my apologies don’t. 2 Responses to Is there an expiration date on apologies?